We are very proud to introduce you to a very special project being done by an equally special group of folks. 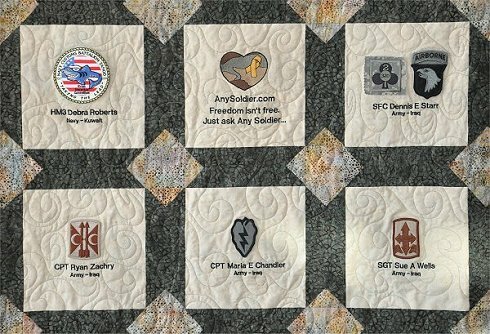 This is the "AnySoldier.com Quilt Project". 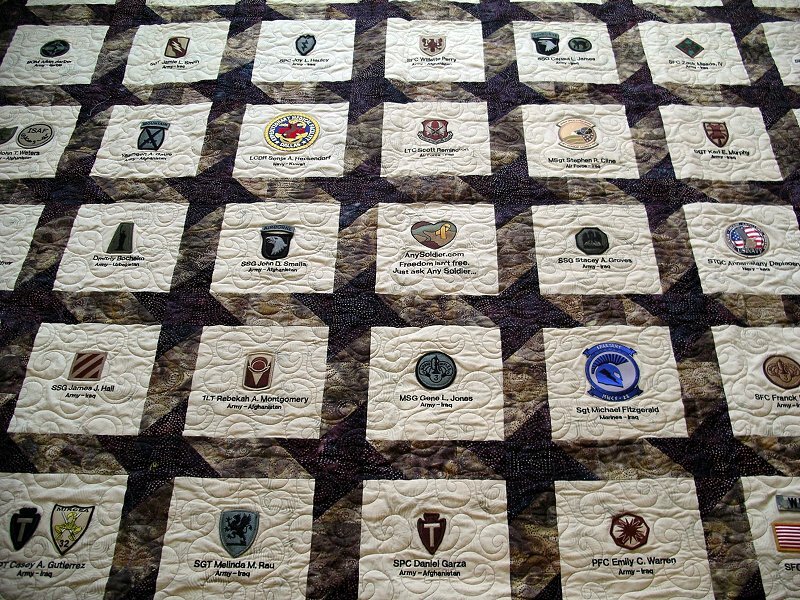 The quilts are made up of the names and patches of AnySoldier.com contacts. The patches were sent to Any Soldier Inc. by the soldiers themselves. Not all contacts are able, nor were some willing, to send patches, so the project represents just a small portion of the many contacts involved in AnySoldier.com. The Ladies of the "Ministers of the Cloth" volunteer their own time and talents to craft the quilts. This is an ongoing project and this page will be updated as it goes. 18 March 2010 The Fifth quilt arrives! Everytime we just know that there is no possible way the next quilt could match the beauty and professionalism of the one before, we are proved wrong. The ladies of the "Ministers of the Cloth" from Southminster Presbyterian Church, Missouri City, Texas have delivered yet another simply amazing bit of work. In one word: breathtaking. 23 April 2009 The Fourth quilt arrives! Click HERE and HERE for closeups of the quilt. 7 March 2007 The third quilt arrives! Click HERE for a closeup of the quilt. 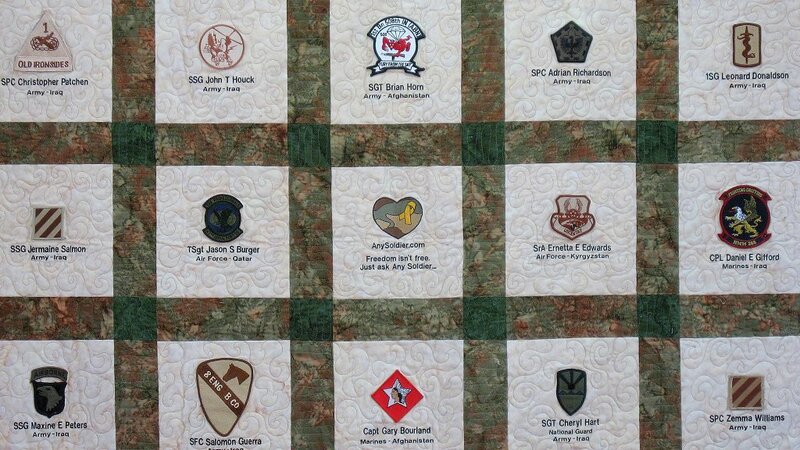 30 Oct 05 The second quilt is completed and sent to Any Soldier Inc. Somehow, these ladies managed the impossible, to make the second quilt as beautiful, if not more so, then the first quilt. 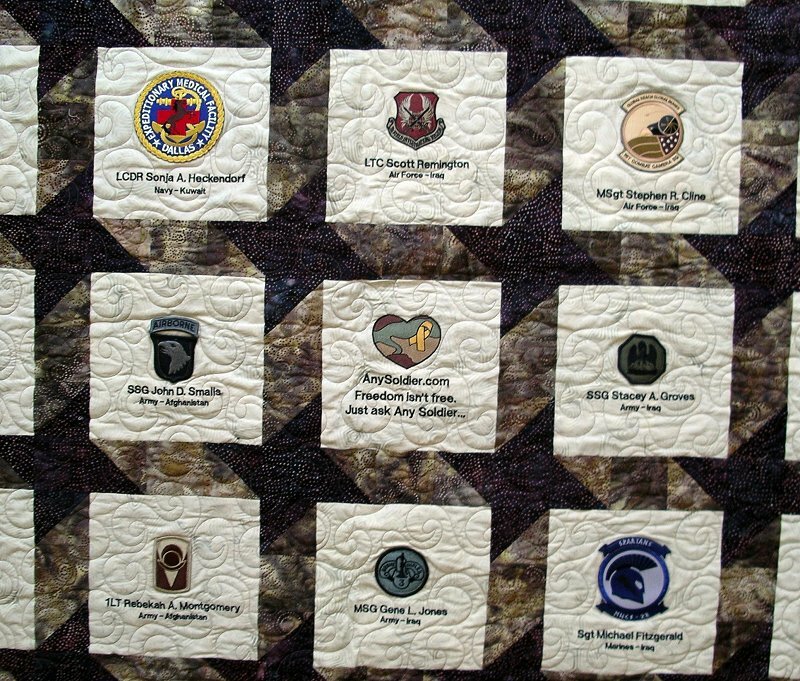 The patches on the quilt come to us from our contacts in the war zones, and the ladies of the "Ministers of the Cloth" in Missouri City, Texas, build these quilts by hand and completely voluntary. 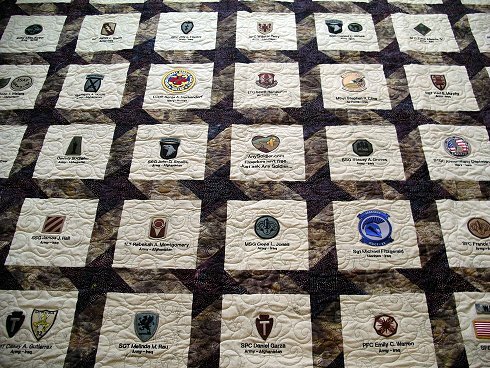 The quilts will be displayed at any opportunity to remind folks there are real people in this war. Our people. Click on the picture for a better view of the quilt. 24 May 05: We received a big surprise today - Margaret Minton & Terry Ancellotti of The Threaded Needle who so graciously donated their time and talent - finished quilting the quilt way ahead of schedule. It's almost finished! We're going to start working on the binding tomorrow and I'll send you more pictures Tuesday night. 11 May 05: We have finished piecing the quilt top! We will start quilting it next week and then finish it up by putting the binding on. Our plan is to have it finished by the 29th so we can present it to the congregation and then get it in the mail to you on Tuesday the 31st. Thank you again for this opportunity - we were all touched and honored to be a part of this project. 4 May 05: We have finally reached the point where we are actually assembling the quilt! Here is one picture of rows 4 and 5. 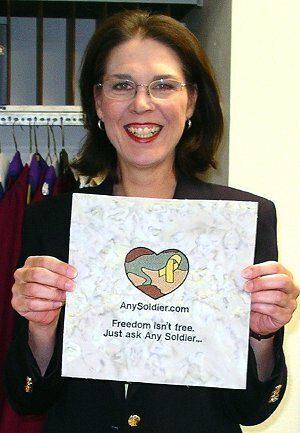 Shari Rickert, leading the team of folks doing the work to make the AnySoldier.com quilts. 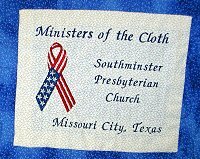 The Ministers of the Cloth are a quilting group at Southminster Presbyterian Church in Missouri City, Texas. 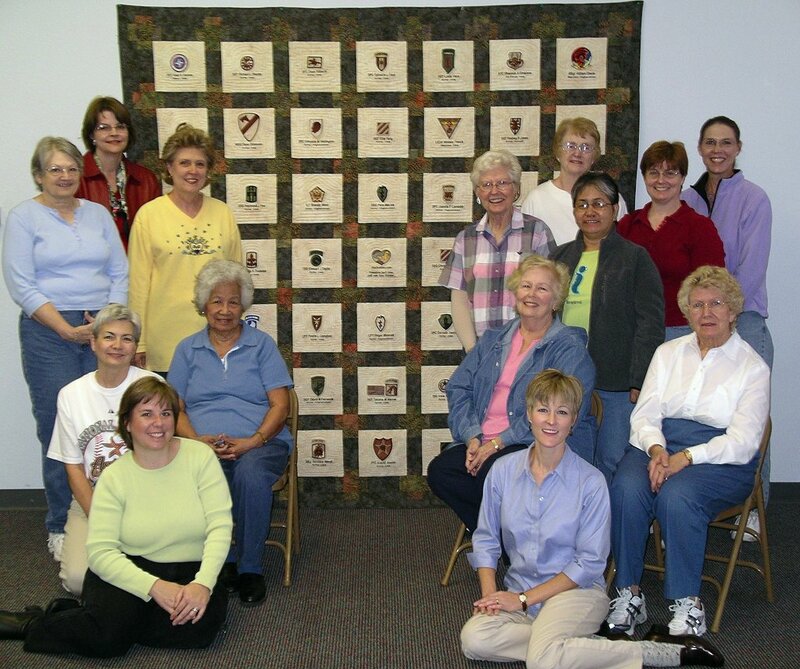 They were organized in 1996 to create baptism quilts for infants being baptized at the church. The group has grown to more than 20 women who meet regularly to make the baptism quilts and quilts for the Southminster School's Gala Fundraiser. Other projects include the Linus Project, which gives quilts to children receiving treatment at Texas Children's Hospital in Houston. Several times a year the Junior Ministers of the Cloth (children and youth) meet with the group to create special projects, most recently two quilted wall hangings for the Ronald McDonald House. 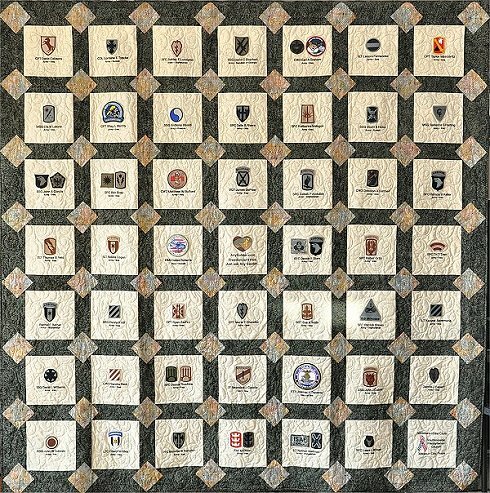 In May of 2004 the group began making quilts for wounded soldiers receiving care at Walter Reed Hospital and Bethesda Naval Hospital. This project has become a very important part of the women's efforts. As one member said 'We don't want their kids to not know their contributions. 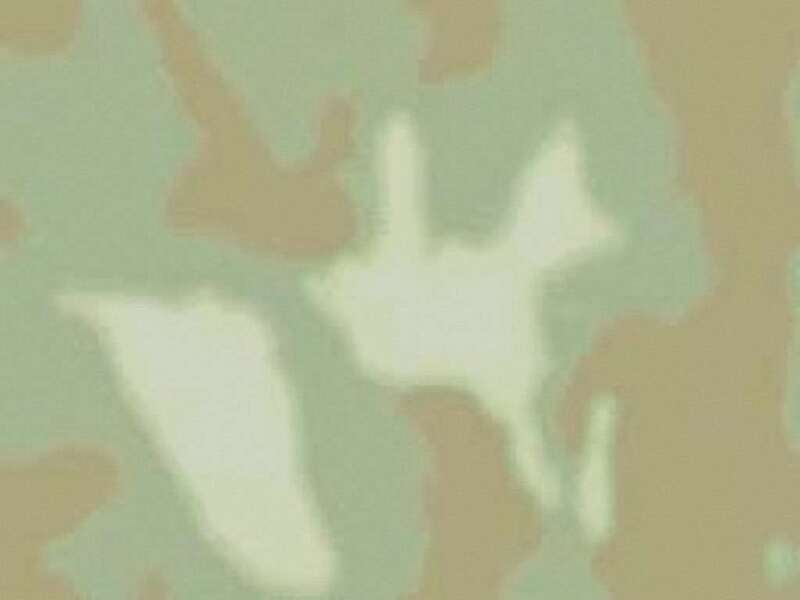 It's a visible symbol that we're supporting the troops and are behind them all the way, and appreciating what they're giving up." And also from another member "It's been such a rewarding experience for all of us this past year, knowing we're doing something, however small it may be, for our troops who are giving so much." The group consists of women ranging in age from the mid 30's to early 80's. 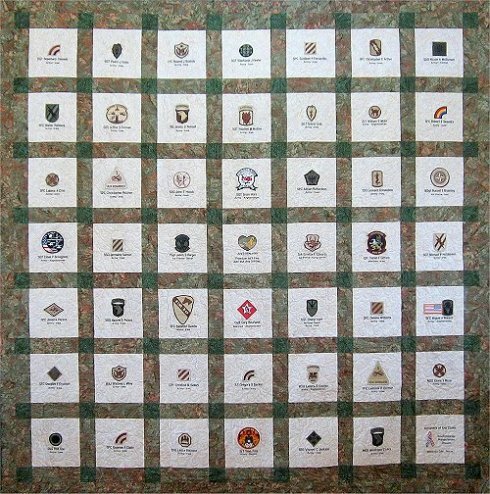 Not all members of the group quilt: some prefer to iron, cut or hand-stitch the quilts pieced by others. 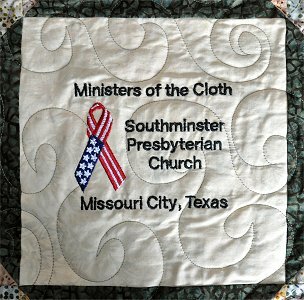 Faith, fellowship and mutual support are as important to the Ministers of the Cloth as the many quilts they have made and donated to others as part of their ministry. Members of the group include: Tanya Martin, Lyn Boyd, Darlyne Fratt, Dorothy Goforth, Vikki Youngmeyer, Janet Meddaugh, Jody Chouinard, Carol Parsons, Theresa James, Jody Harrington, Gloria Fabila, Anastasia Layus, Bess Tucker, Iris O'Dell, Sally Dougherty, Nancy Kosarek and Shari Rickert. 30 April 2014: We were sent these pictures of the newest 'mini quilts' that will be on their way here soon! NICE!! !